Last night I headed to Dublin to watch Ireland host Uruguay in an international soccer friendly. However, that doesn’t mean that I don’t have any quizzing action for you today. Opta Sports are the company that, according to their website, are “passionate about collecting, compiling, databasing and supplying sports data”. You’ve probably heard of them if you’ve ever watched a live football match from the UK as they supply the media with stats such as: highest percentage of shots scored, who has covered the most ground during a match, who’s conceded the most throw-ins etc. Last week, Opta Sports hosted a table quiz for the professional sports media in the UK. It was won by the team from Sky Sports, closely followed by ESPN and The Guardian. 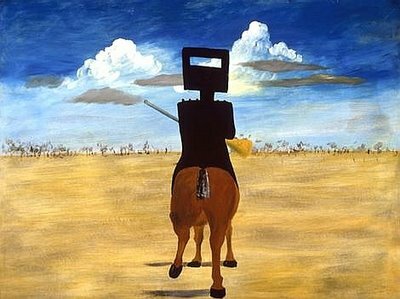 Sidney Nolan painting of Ned Kelly, 1946. Here are the answers to the questions posted in Friday’s Long lost cousin Sidney. I won’t be in Gilligan’s next Tuesday night, alas. I’ll be in Dublin watching (hopefully) Luis Suárez and Diego Forlán playing football. But that’s next week. Let’s get last Tuesday out of the way first. Sometimes you get asked a question and not only do you not know this particular answer, but you know that you’ve never even heard of the person/place/thing involved. OK, that happens a lot of the time. On rarer occasions though, you hear one of these “nope, never heard of that, definitely” questions and you feel a bit peeved because you wonder how this can be. “How come I’ve never heard of that?” or “How did I get to this point in life without even chancing upon this fact?” you ask. You know you would have remembered because it’s related to something you’re interested in or there’s some other connection that definitely would have made it memorable. But the simple fact is, bizarrely, you and this fact avoided each other your entire life. This happened to me on Tuesday night. 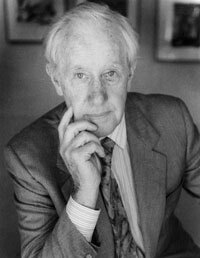 This week’s quiz master at Gilligan’s asked us about “famous Australian artist” Sidney Nolan. Sidney Nolan? Well, we share a surname so, if I’d ever heard of him, I would have remembered. But no, I hadn’t. I’ve looked him up since and, yes indeed, he is a renowned artist – one of Australia’s most famous sons, in fact. Alas, for my team, none of us were even aware he had existed. Are you organising a quiz in the near future? 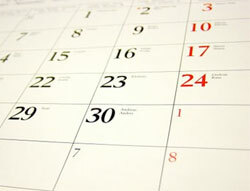 Would you like to have it included on the tablequiz.net calendar? I’d had several requests of late but these have reached me in a higgledy-piggledy fashion: some arriving in my email, others posted as comments on various pages etc. So, I’ve now created the ‘Running a quiz?‘ page, through which anyone can submit their quiz details to the site’s calendar. If you’d like some advice on how to put the quiz together, click the continue. Hereby follows the shortest ever post on this site. As much as I try to pad it out, I’ll surely never be able to lengthen this article to make it look like it isn’t not very big. Even my thumbnail picture seems tiny. 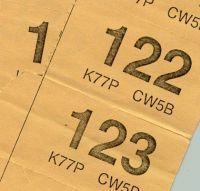 Anyway, click continue to see all three answers to the questions asked in Friday’s post. 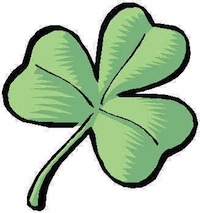 Just a very quick post this morning as I am about to head out and do some volunteering for the local Community Radio station at the nearest parade, in Claremorris. 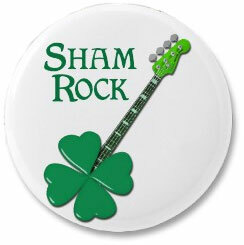 Anyway, click on the link below to see the answers to the questions posted in Shamrock and roll. Last night’s quiz in Gilligan’s was news-worthy for two reasons, neither of them brilliant. I received my first serious complaint about the blog. A gent who hosted a quiz here a few weeks ago objected to the fact that I’d used his work, and (first) name, without his permission. I offered to take down the post involved and he agreed. So I have now done that. I think the quiz master also didn’t feel too bad about it – he voiced his relief that there was no need for a tie-breaker!